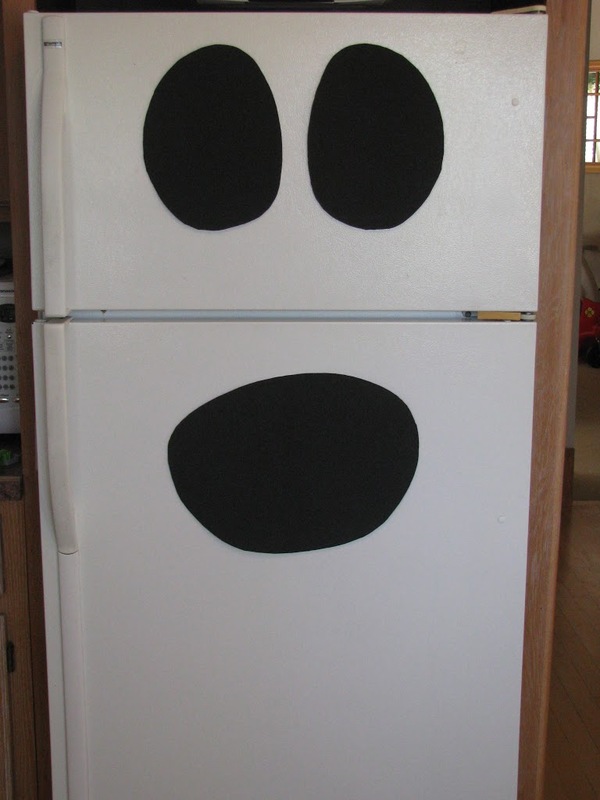 I really don’t like my white fridge. I have been secretly waiting for it to die so I can go out and buy a new beautiful stainless steel one. BUT…I have a feeling that this will be one of those fridges that will last forever and ever. Now (finally!) I have a reason to celebrate my white fridge! BOO! My boys weren’t too happy about giving up their Word Whammer fridge space ﻿but once they saw it they both laughed and thought it was pretty cool. For those of you that haven’t figured out that it is supposed to be a ghost, you are not alone. My husband came home and said “What is it? Mickey Mouse?” Really Dave??? Mickey Mouse??? 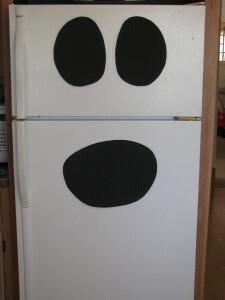 If you would like to make your own Mickey Mouse ghost fridge all you need is some black foam, magnets and glue. Cut out your shapes, glue on a few magnets, and 2 minutes later you are done! I must say, that I did not come up with this brilliant idea on my own but I can’t figure out where I saw it. Let me know if it was yours! So, for now, I am actually liking my fridge. In two weeks, when Halloween is over, and the fridge is once again covered in the Word Whammer and various other children’s magnetic toys, I will go back to wishing for my beautiful stainless steel one. 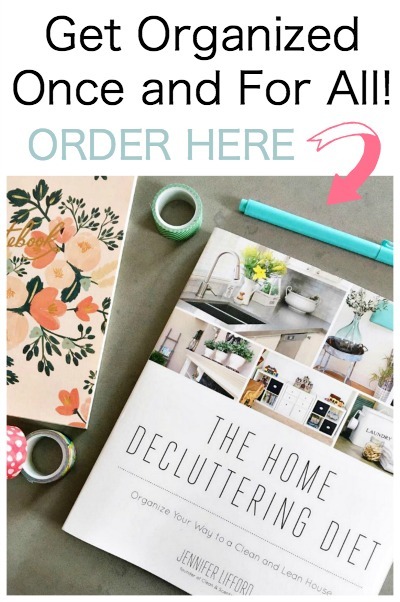 I am linking up with House of Hepworths, Fun To Craft, Tatertots and Jello, A Little Lovely, I Heart Naptime, Polly Want a Crafter, Support Blog for Moms of Boys, Sumo’s Sweet Stuff, C.R.A.F.T. and The Shabby Nest. Haha that is hilarious! I knew it was a ghost without reading, but I bet my husband would say the same thing… men just don’t get anything do they?! Haha. I Just LOVE your blog. I am subscribed to you in reader but I decided to become a follower, I know how good it feels to see your numbers go up each day! LOL Mickey Mouse?? Pretty funny! I really do like the idea of just having fun with what we have. 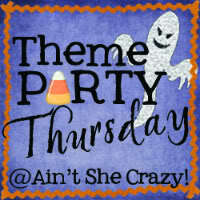 Thanks for linking this up to Theme Party Thursday. Cute…I never thought about getting the fridge involved in decor. Clever! my fridge is also white, but white on Halloween is the best ! Cute and simple! Thanks for linking up to Mad Skills Monday!